The Boxster E 2 prototype. Read about it in this issue. The driving season is here, finally, after a slow start, thanks to Mother Nature. Your region offers a variety of events in which you can enjoy your Porsche in the company of other Porsche afficionados. Porsche Parade, the national gathering of PCA members, is coming up too -- at the end of July. Details about the region's events in June and July, Porsche Parade, and news about Porsche follow in this issue of Steinlifters Online. We hope you can join us for a couple of activities this summer. June 10 – Driver Education (DE) at Blackhawk with Badger Bimmers. This is a great track for novices and experienced drivers alike. Details including link to online registration here. June 11 – Casual dinner at Delafield Brew Haus. RSVP by June 9. Order from a varied menu. Pay your own bill. Join us for good conversation about all things Porsche. Event details here. June 18 – Spring driving tour. This is one of our region's most popular events. Spend time in your Porsche, exploring some great roads in Wisconsin. We will have a lunch stop and will conclude the day with dinner at the end of the tour. Don't have time for a full day? Join us for part of it. Details here. June 25 – Fox Valley Region Ladies Driving Tour. Ladies, drive your Porsche or the family Porsche (or his Porsche) on this ladies driving tour hosted by the Fox Valley Region, our neighbors to the north. Details here. July 3 – Autocross at Miller Park. Support our region's autocross events. This is a low-speed driving event that tests your ability to maneuver a course laid out in an obstruction free parking lot. Details here. July 7 – Board meeting at Wisconsin Club - Country Club. 6200 W. Good Hope Rd. The meeting starts at 6:30 p.m. Food and beverages available. All members always welcome to sit in on the meeting. July 16 – Road & Track Concours. Join us for a driving tour that will start in Cedarburg and wind its way to Elkhart Lake and dinner at Lake Street Cafe (order from the menu and pay your own bill). Then take in a fabulous concours d'elegance on the streets of Elkhart Lake, featuring more than 100 cars in outstanding condition. Refundable deposit required for dinner. Details here. July 31 - Aug. 6. Parade Week. Details here. The Milwaukee Region Board of Directors wishes to express its sincere thanks to all 154 members who took the time to vote on the five recently proposed amendments to our By-Laws. 88.9% of the votes received were opposed to the first four amendments. According to Article XI, Section 2 of our By-Laws, these four amendments are rejected by a majority of the votes cast by the Membership. 92.2% of the votes received were in favor of the fifth amendment. According to Article XI, Section 2 of our By-Laws, the fifth amendment has been passed by a majority of the votes cast by the Membership. Therefore, the fifth amendment will be incorporated into the Milwaukee Region By-Laws. The strong and careful participation of all those who voted on these important matters reflects well on the dedication of our Membership. Dave Kachelek is new to the Milwaukee Region. He has owned his 1981 928 Porsche since last October. 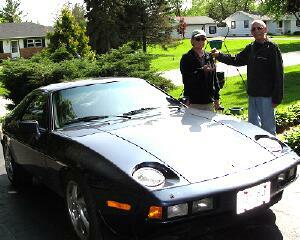 Here’s Dave’s story about how he acquired the 928. 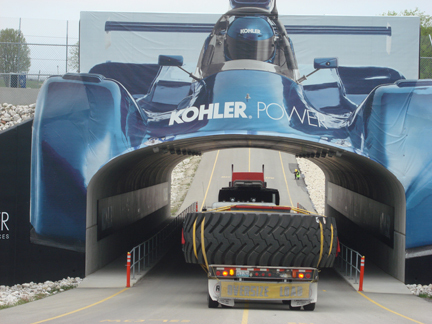 “About three years ago I was hired at a company called Machinery Service & Design. I was hired to take over operations for the owner who was to retire in a year. I have since purchased a large portion of the company and have been named President. The car never saw any bad weather and was always kept inside. The engine compartment is still nice and clean and the leather interior is in almost perfect condition. The car had 66K miles on it when Dave bought it in October 2010. “When I purchased the car last year, I had the car on the road for two weeks and the water pump started leaking. So I had the water pump and timing belt replaced and then the cold weather set in. Over the winter months I did a complete brake rebuild, fixed the odometer, touched up the paint chips on the hood, fixed one door lock, repaired the driver’s electric seat, and door lock motor.” Dave also installed a new stereo system along with a 12-inch sub woofer and 1000 watt ADS amp. “To date this, this is the only Porsche I own but that is subject to change,” Dave concluded. Jim Morris also joined the region recently with his 2008 Cayman S, Macadamia Dark Brown Metallic on the exterior with a sand/beige leather interior. He bought the car March 31, 2011, from Concours Motors. The Cayman S was previously a leased vehicle. With only 12,000 miles on it and still covered by the new car warranty through 2014, the purchase decision was an easy one, no doubt. “I've since put a few hundred miles on it. I love it,” Jim noted. New to Porsche ownership Jim said he "longed to own a Porsche for years and figured ‘life's too short.’ ” Many of us agree with you on that point Jim. He is looking forward to driving and social events with PCA. Jim attended the region’s casual fish fry in April, just a week after he purchased his car. 2001 – Jeff Reichard, Robert V. Baker, Michael H. Doland Jr. The May 22 autocross in the parking lot at Wisconsin State Fair Park featured a session to introduce drivers to autocross as well as a competitive event in the afternoon. Details here including results of the competitive event. On May 7, while region members were enjoying the thrill of driver education at Road America, some members participated in a drive to Road America to tour the track at the end of the driver education event. Earlier in the day, during the lunch break for the DE participants, military veterans who live at the Zablocki Medical Center, had arrived by bus and were ready to tour the track as passengers in the cars of the DE participants. A full day of fun for many people. Read the details here. Also check out this photo album of the DE event in action. The Paint Tech Session on May 21 hosted by region member Dave Zimmer, was well attended. Do-it-yourselfers and those who just wanted to understand more about the finer points of restoring the paint on a Porsche learned a number of tips and techniques. Read the details here. Check out the classifieds here. Check out this video at an event in Carlisle, Pa., recently called Speedsters Meet Spyders. This was not a PCA event but it sure looked like the typical kind of fun that results when people who love Porsches get together. The Porsche 911 Turbo and an aging VW Beetle go head-to-head in an extraordinary one-mile drag race. Richard Hammond in the Porsche must cover the distance on the ground while the Beetle is dropped from a helicopter. Which will win? The Porsche or gravity? Watch this video. Note, there is a brief commercial at the front of it. Click here. 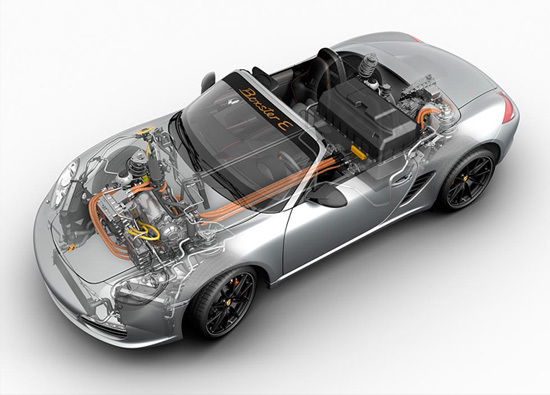 Boxster E prototype news. Details here. ATLANTA, June 1, 2011 -- Porsche Cars North America, Inc. (PCNA), importer and distributor of Porsche sports cars, Cayenne SUVs and the Panamera four-door sports sedan line-up in the United States, today announced May sales in the United States of 2,817 units compared to the same period last year when it sold 1,873, an increase of 50 percent.